The study of information, as separated out from IT and technology, allows businesses to identify and isolate areas of underperformance. Drawing on theory and practical case studies, this paper looks at the importance of information management to help drive business decisions. The Information Technology (IT) world is, or close to, a trillion dollar industry and most of this money is spent on the purchase of technology. Significantly the study of information is not common practice in the business world. The separation of information from technology is mandatory in order to recognise information as something tangible in its own right. By definition once something is tangible it has attributes. To understand information is to understand its attributes. This paper comprises of two parts. Initially it discusses and defines information from a theoretical point of view and then places the theory in a practical business context using three examples. By way of accreditation, my foundation thinking on this topic stems from conversations with, and the writings of Russell Swanborough. He is most certainly a genius and a person who should be speaking on the world stage. The essence of Swanboroughs message is that there should be no such thing as an IT strategy. Rather there should be an ‘I and T’ strategy or simply an ‘I’ strategy on its own which is implemented through the application of ‘T’. The Information Technology (IT) world is, or close to, a trillion dollar industry and most of this money is spent on the purchase of technology. Significantly, the study of information is not common practice in the business world. What is information made up of? Information is made up from two primary attributes; Quality and the Physical. 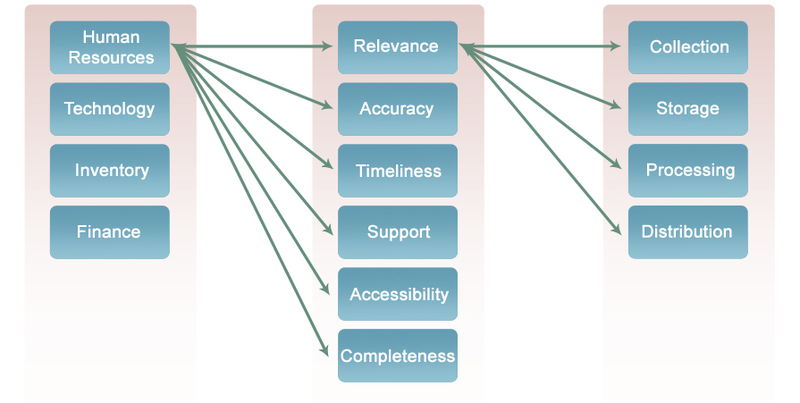 Relevance; Who need to produce or receive the information? Timeliness; When should the information be produced or received? Support; How do you get help on the information? Accessibility; How will the information be accessed? The primary principle behind these elements is that they are intangible. They don’t really exist and if something does not exist it cannot be directly addressed, only indirectly. Distribution; The manner by which information is distributed. By contrast these elements are very tangible and can be addressed directly. Consider the person who complains to the doctor that they have a headache, runny nose, dizziness and sore joints. The doctor listens to these symptoms and diagnoses a severe cold. He then asks what the patient has been doing to make him that sick. ‘Walking in the rain’ is the reply; to which the doc replies ‘well, stop doing that and you won’t get sick’. It is a classic case of cause and symptoms. You can’t treat symptoms; you can treat the cause. The same applies to information. The quality attributes are the symptoms and the physical attributes are the cause. You cannot change a quality attribute directly, only indirectly through the physical attributes. Consider the manager who complains that the information they receive is inaccurate, late and lacks relevance. To address these weaknesses, the analyst will review how the information is produced to determine what is causing the information to be late, inaccurate and irrelevant and will make changes accordingly. These changes will include changes to what, when and how information is collected, how it is processed and who it is distributed to. In other words, the changes will be applied to the physical attributes. By changing the physical attributes you change the quality attributes. The business community is predominately concerned about the quality attributes. Managers do not really care how the information is collected, just that it is accurate, accessible and complete (etc). The quality attributes provide the business requirements, that can only be resolved by the physical attributes. This means the IT community tends to focus on the physical attributes. Their role is to improve the way information is collected, stored, processed and distributed. Hardware and software is good for collecting, storing, processing and distributing information. There is a many to many relationship between the physical and quality attributes. When an analyst is considering changing one or more of the quality attributes, they will need to consider how each physical attribute must be modified to effect the change. Equally, when changing a physical attribute, the analyst must consider the ripple effect on the quality attributes. 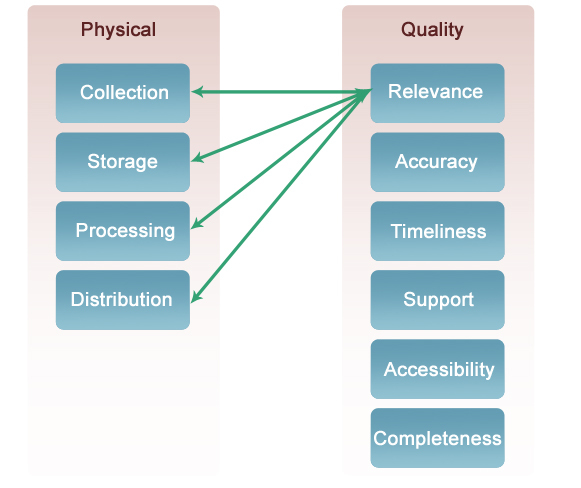 To extend these concepts it is important to describe what comprises the message or content that is moving between the Physical and Quality attributes. Previously I mentioned that the business community is focuses on the quality attributes. Therefore it is important to consider what makes up each attribute. The concepts of ‘relevance’ or ‘accessibility’ (etc) are inconsequential in and of themselves. What makes them consequential is what content is presented for evaluation as relevant or accessible etc. A business is made up of 4 elements or factors of production; Human Resources (HR), Inventory, Technology and Finance. To make a product you need to turn raw material into finished goods. 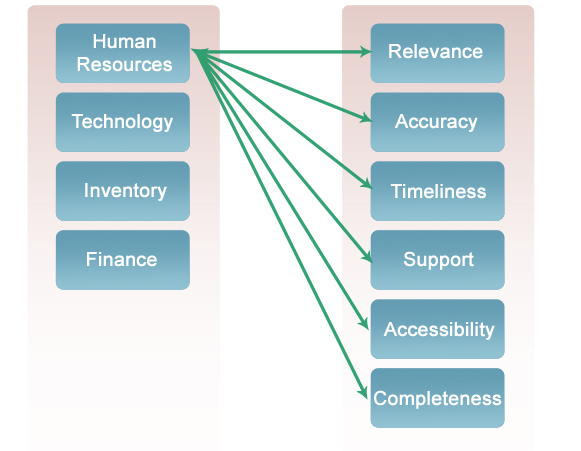 Finance, HR and Technology are the catalysts for the transformation of inventory. This means that the inventory leaves the company in the form of finished product but the Finance, HR and Technology remain. I realise this is ‘a long bow’ when it comes to Finance, but in a good business, when the cycle is complete you should have the same or more money than when you started. Technology includes all facilities, equipment and machinery and IT. Each quality attribute is defined by its relationship to each factor of production. The quality attributes will always be applicable to every situation but it is acceptable that not every factor of production will be applicable to every situation. When information is being collected, it must be done in a manner that is considers its relevance to its audience, and relevance is defined by the aspects of the HR that is material to the audience. The same applies to all relationships in the model. This model is now extended by the introduction of time. The key concept is that time provides context to decision making. 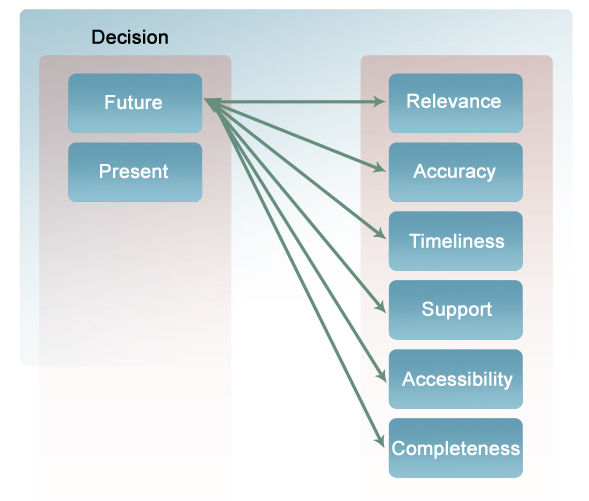 You cannot make an informed decision without considering the time component. Consider being told that a factory operates at 1000 units. Is that good or bad? Without time you have no way of knowing. 1000 units a minute is impressive; 1000 units a year less so. An investor offers to double your money. Do you invest? If the return is in a week, then it is a good deal; if the return is over 10 years then the value of the deal is diluted. The relationship of time to information can become complicated. In a pure sense there are three time domains. Future; What are we going to do tomorrow? Past; What did we do yesterday? Present; What must we do today? Each time element is cross referenced to the factors of production. Again on a many to many relationship. Traditionally these information relationships manifest themselves as lead or lag KPIs. Frequently, though, not all factors of production are measured. Often the primary focus is on finance and the other three factors are not really covered or ignored all together. There is a fourth time component to information being the absence of time. The building blocks of a business are not associated with time, in that they do not change with the passage of time, or change so infrequently that the change is not material. I term this forth component as data. It is descriptive in its nature. An example would be my name. You cannot add time to my name. Other examples are the VIN number in a car. That never changes no matter who owns the car or what happens to the car over time. Part numbers do not change, or inventory bin numbers. The volume of inventory in a bin will change with time, but the bin number does not change. You do not use this type of information to make decisions, rather you make decisions about this type of information. A traditional definition of information is that it is data with context. This is broadly acceptable, except that in terms of the above theory, context is time and you cannot add Time to data. I close this section on the theory of information with the following summary statements. Information can be defined as a time bound package contextualised by its quality attributes. The value of information is determined by the adequacy by which the requirements of each quality component are met. To extend the above concepts and place them in a business context requires the examination of process. There are three types of process. Management process, defined as operations management. The information process is the glue that binds the Management Process to the Business Process. You can only make a decision about the Present or the Future. While doing so, you should consider the past – as often the pending decision will be to avoid the mistakes of the past. But you can’t change the past. Therefore you can only make decisions for the Present or Future. To do this you need to know everything you can about the decision at hand, so all quality attributes must addressed and you can only make a decision on the factors of production. The above holds true for strategic decision making when the focus is on market share and corporate growth. In this case, completeness of information includes market data. But you make a decision on changing your presence in the market in order to affect the productivity of your factors of production – to improve the return on capital employed. The business process refers to the transactional activities in a business. This can include processing applications in the back office or bending steel on factory floor. The marriage of the two processes is as follows. Above the line is the management process. Below is the transactional process. Now, let’s introduce the factors of production. Inventory moves through the process and can be broadly defined. Inventory for the back office is bills, applications, invoices etc. Inventory for the production environment is raw materials, work in progress and finished goods. Earlier I termed the other three factors of production as catalysts for change, in that they contribute to the transformation of inventory from raw material to finished good without actually changing themselves. As previously mentioned, at times this can be a long bow when it comes to Finance. It is valid at this point to separate IT out as distinct from production technology, as it provides the dual function of being a production engine for producing outputs such as forms and documents as well as being responsible for moving information along and between processes. The large green arrows represent the physical flow of goods and services. The black arrows are the flows of information. 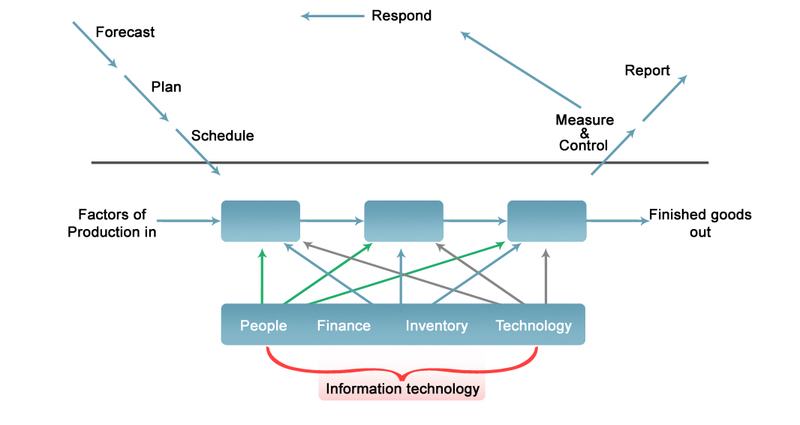 The diagram does not show it (to avoid becoming too cluttered, but there is an implied information flow from HR, Finance and Technology to all the elements of the Management process. The following three case studies illustrate how the above concepts can be used in a practical manner. The client requirement was to prepare a business requirement to guide the purchase of a new ERP system. 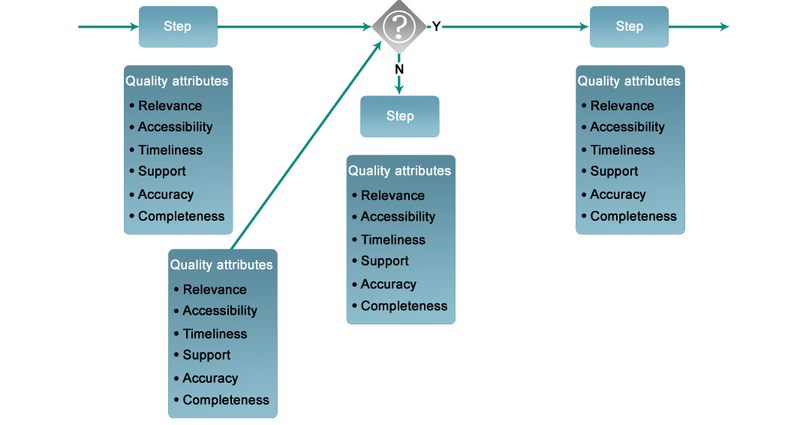 We created a single high level map of the business process and defined the quality attribute for each step. Then we completed a definition for each attribute as it applied to the process step. The following table is a very simplistic worked example of this concept. A second example is where we used the attributes as the metrics in a diagnostic to determine the effectiveness of a recently implemented ERP system. A survey focused on the business needs not the technology itself. It set out to answer the question: is the business getting the information it needs to maintain maximum performance? The survey separated the respondents into groups; those that create information (Process performers) and those that receive it (Managers). Process performers work in the business processes and are responsible for generating the information manager’s use in decision making. In the two example graphs below it is clear that process performers acknowledge there is a problem with the accuracy of their work with a small number of respondents perceiving their output to be precise. Conversely, management perceive that the information they receive is moderately accurate at best. Legend: Ct = Current, Id = Ideal. Similarly, process performers perceive that the work they produce tends towards being fully complete but managers perceive what they receive to be incomplete. A third example is from a client who requested us to map the purchase to pay process, define the information requirements, define the system interface points and develop a business specification for an imaging and workflow solution. As first step we mapped the business process. 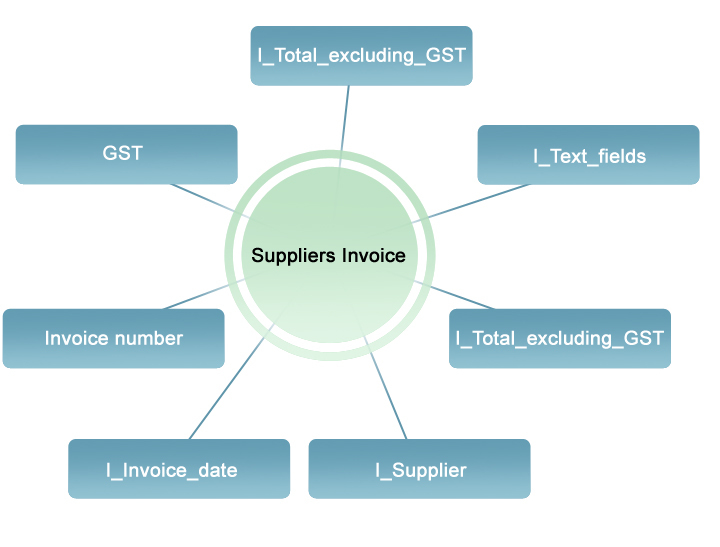 Then we determined the relevant information sets (eg suppliers invoice) required to manage the process and the information fields that make up each set. Then we determined the attributes of each field and its source. This detail is not shown due to confidentiality agreements. I close with the observation that it will always be substantially more expensive to fix technology after its purchase than it would have cost to properly define the information requirements at the outset. I welcome your comments on the above. If you disagree with me let’s have the debate as it drives the learning process for both of us.